Comprising up to 75% of the wall space, base and wall cabinets--along with the occasional pantry and tall cabinets--are the main element that states your kitchen's style. The ever-popular Shaker style, as shown here, can be brought into the 21st century with brushed stainless steel fixtures and a pepper-red paint scheme. Add a natural stone like travertine for a perfect balance of textures and colors. 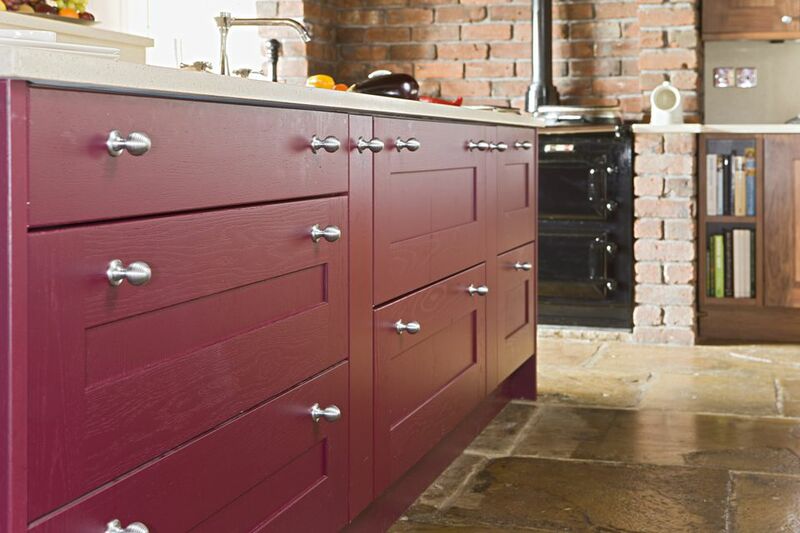 Give your kitchen a rich, modern look with dark-stained kitchen cabinets. The translucent, full door glass layered panels and interior lighting takes the edge off of the darkness. Crisp horizontals in the form of nickel finish fixtures further enliven this kitchen. It's easy to duplicate, and relatively inexpensive--it comes from mainline cabinet retailer, Kraftmaid. Merillat has good kitchen cabinets and reasonably priced, too. And for anyone looking for kitchen cabinet ideas in the slightly-showy arena, this is one. It's Merillat's Venetian Fresco cabinets, part of their LaBelle Fresco line. Check out the way the back-left cabinet is backgrounded in Pistachio Avonite (a solid-surface counter material). Also, that slab of apparently foot-thick granite on the right? It's nothing more than thin laminate wrapped around a plywood base. Not for the faint of heart: variegated birch panels in Praline finish for maximum visual impact. Add in that weighty kitchen island in Onyx finish, and you've got the perfect kitchen cabinetry for any superhero crimefighter. Here's a kitchen cabinet idea that can go either way. Merillat Masterpiece is a square-edged laminate cabinet that comes in only white or cream. But that's the point of the Masterpiece series. It's designed purely for a contemporary look. It can serve as too-cool-for-you kitchen cabinetry or as practical home office furniture. Heck, you could probably stick in it the garage, if you wanted. Furniture company Thomasville manufactures stylish kitchen cabinets that excel in practicality. Witness this box column pullout. It's an awesome way to make use of those wasted inches next to dishwashers--the space that typically just gets a fill-in panel. Plenty of room here for spices, boxes of pasta, you name it. Surely, you've seen slide-out kitchen cabinets before. You're thinking you've seen them all. But Thomasville Cabinetry (the leaders in practical cabinetry) has what they call a SuperCabinet. This kitchen cabinet idea allows you to slide out practically every square inch of available space for better reach. And "toe kick drawer" means using up that formerly wasted space above floor level but below the bottom-most cabinet level. It's the area that is usually covered up by a panel called a toe kick. Armstrong, mainly known as a manufacturer of flooring, also produces kitchen cabinets. This design fuses the kitchen with the dining area. A nook or banquette is spliced onto the back of Town & Country Maple Cabinets built up to form a kitchen island. The finish on this island is Espresso. Armstrong does well when it comes to solid, practical kitchen cabinetry, and this is exemplified by its ChefCenter series. ChefCenter is designed with practicality in mind--tons of pull-outs, sliders, drawers sized around pots and pans (instead of the reverse), and much more. Starmark Cabinetry is not only headquartered in Sioux Falls, SD, but it builds its cabinets there. It produces cabinets ranging from casual-country to sophisticated modern. Cabinet-wise, this kitchen has a bit of everything. Glass doors. Bi-level counters (with breakfast bar). Fluting. Cabinet above microwave. Even a nifty little alcove built into the kitchen island. Starmark Cabinetry. Glendale door style in Cherry finished in Nutmeg with Chocolate glaze.